Installation: Drop the .mzp file in a viewport. The macroscript is saved in the userMacros folder. The tool is accessed through the right-click quad menu of editable poly objects when in edge, border or polygon sub-object mode. When downloading the file, its extension is sometimes changed to .zip. Just change it back to .mzp before dropping it in max. For further customization, the tool appears under Regularize Edge Loop (Poly) in the Editable Polygon Object category of the Customize User Interface dialog. v1.1: Just a tiny change in the code. Works the same but is a little faster and clearer. Submitted by Ripio Suelto on Wed, 2018-12-19 21:12. You make me happy, man. And work fine in Max 2017. Thanks! Submitted by atanguay on Fri, 2018-07-06 09:28. Submitted by Vladimence on Wed, 2018-01-10 08:29. Hi im very new to the use of scripts in 3ds max so this might to user error but i cant get the tool to work on any type of poly object, ive tried a keyboard short cut and a tool menu button but neither seem to work. Any suggestions would be great thanks! Submitted by .eb on Wed, 2017-09-13 17:43. 'the script is in the package. ..edit the file as needed. Submitted by Smallpoly on Mon, 2017-08-07 11:14. Hey, just FYI - photobucket changed their policy and decided they don't want to let people use them as an image host anymore so your thumbnail isn't showing up. Submitted by Smallpoly on Tue, 2017-06-13 10:38. This is still great!!! I use it all the time! Submitted by Pankuczy on Mon, 2017-04-10 06:17. I only had to restart max before it became available in menu. Submitted by Halmat on Mon, 2017-01-23 13:05.
how can Update script ? Submitted by luxxeon on Thu, 2016-12-29 15:16. Andrea, I tested it and it works fine for me in 2017. After you install the script, exit 3dsMax and restart. 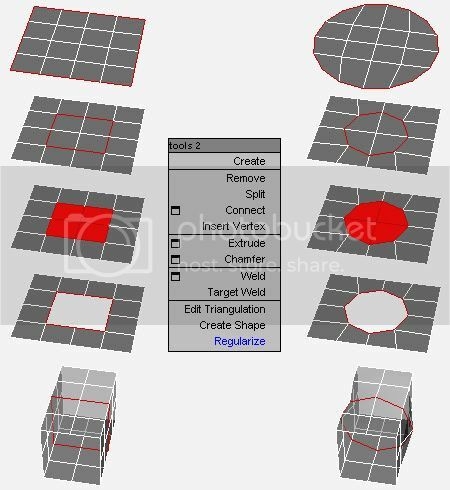 It will appear under Editable Polygon Object Category in your Customize User Interface panel as "Regularize Edge Loop". You can then add it to a hotkey, or put it in your Quads menu. It will only work on an Editable Polygon Object, not Edit Poly modifier. You need the updated script for that. Submitted by Andrea on Thu, 2016-12-29 05:01. 3ds Max 2017 not compatible? I have 3ds Max 2017 and the script is not working at all. I tryed to drag on the viewport and nothing happens; tryed to run the script and nothing happens. Anyone could help me?